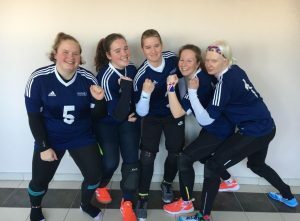 Two Great Britain goalball teams have claimed spots on the podium at the International Goalball Tournament in Trakai, Lithuania. The women’s squad collected the gold medal, whilst the under-23s men’s team picked up the bronze medal in the youth division. 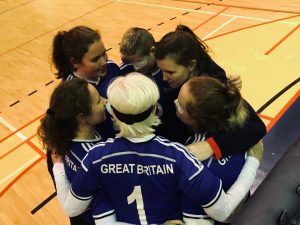 This was the first time the women’s Great Britain squad have won the International Goalball Tournament and their first international competition victory since European B Championships in 2016. The team consisted of Sarah Leiter, Kali Holder, Antonia Bunyan, Amelia Robertson and Lois Turner, and was coached by Becky Ashworth. There were individual honours for two members of the squad – Kali Holder was top goal scorer, finding the net 15 times, and Sarah Leiter won best defender. Getting underway against Germany, Great Britain triumphed in a close-fought 7-6 match before narrowly losing out to the Ukrainian First Team. Great Britain then went up against the Ukrainian Second Team and registered an emphatic 11-6 scoreline to secure their spot in the next round. Into the semi-finals, the women’s team faced Germany again. The match went the distance into extra-time before Amelia Robertson, the youngest member of the squad at 16, scored the winner to progress to the final. The final was another close game against the Ukrainian First Team, but this time Great Britain managed hold on to win 3-2 to take the gold medal. Speaking the gold medal, Becky Ashworth said: “The quality of opposition in this tournament was really high, so we’re extremely proud that the team have managed to come out on top and claim the gold medal. “Competing across Europe and winning competitions like this has such a positive impact for the development of this squad. We have a great mix of young players, with Amelia and Lois breaking into the team recently, and experience from Sarah, Antonia and Kali, who were part of the group that won gold at the European B Championships in 2016. The men’s under-23s team that travelled to Lithuania included debutant Mo Ahmed, Joe Roper, Sam Hoskin, Naqib Ahmed and Stuart Hudson, the youngest player in the squad at 16. The team was coached by Faye Dale. The claim the bronze medal, the men’s under-23s team registered an impressive 11-1 win against Latvia. Later in the competition, a resounding performance saw them overcome the host nation in a remarkable game that finished 22-12. Speaking after the tournament, Faye Dale said: “We’re really proud of this young squad achieving the bronze medal against a strong group of nations. First Goalball UK school competition is a great success!